Arc provided by the publisher for an honest review. 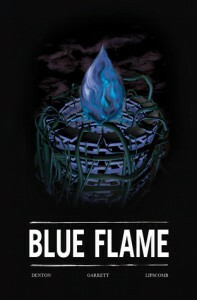 Blue Flame is a graphic novella, with the promise of a gruesome horrifying tale with a touch of Lovecraftian mythopoeia and a little bit of bizarre thrown in. Set in Kausia a city you don't want to visit, inhabited by a race of people you don't want to meet, not even in daylight, worst of all is the strange shadow walker Shuffle. Despite being a collaborative effort the story and the illustrations fit together rather well, with macabre visuals conjured up to match and extend the narrative, this is a good old fashioned horror story. If a strange fearsome creature whom you suspect might be slightly demonic, not your ex, asks you to find the flame of everlasting life, it is probably wise to just drop everything else and start an immediate search. You need to give the creature something, and your soul should be the very last thing you have to give up. It is a little short, but this is not the end of the story, more books are planned. The sequel, Blue Flame: Extinguish was recently been published in April 2014.